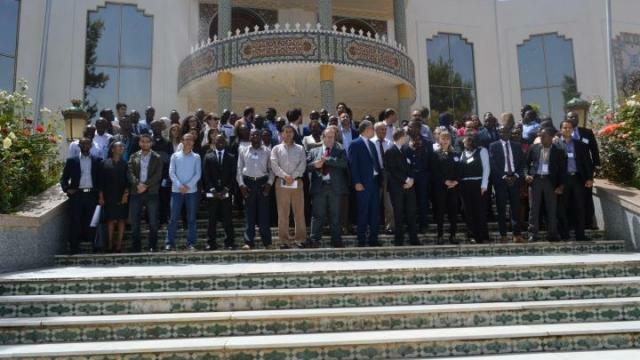 On 28 May, the second cohort of students of the Pan African University Institute of Water and Energy Sciences, including Climate Change (PAUWES), attended the first PAUWES International Water and Energy Fair in Tlemcen, Algeria, jointly organized by the United Nations University Institute for Environment and Human Security (UNU-EHS), the University of Tlemcen and the German-Algerian Chamber of Commerce and Industry (AHK Algeria). Students from the UNU-EHS-supported online Community of Practice (www.cop-pauwes.net) Career Service team at the Institute were actively involved in the planning, organization and implementation of the event, starting with a welcome dinner including all exhibitors from Algeria, Germany and the five geographical regions of Africa. The agenda of the fair included key note presentations by exhibitors, a panel discussion and inspirational talks by high-profile guests Mr. Foster Ofosu from the African Development Bank (AfDB) and Rebecca Enonchong from Venture Capitalist for Africa (by video call). In the afternoon, students had the opportunity for individual discussions where companies, finance institutions, higher education institutions, NGOs, research institutions and an African Union institution of the water and energy sector were represented at 13 fair stands in total. Martin Lyambai, Energy Policy student and Community of Practice Leader from Zambia, said, “The only way to do great work is to love what you do. The international water and energy career fair exceeded my expectations. I was able to meet and interact with qualified professionals who love what they do and have a diverse experience in water and energy. The diverse group of keen individuals at the fair came with an open mind, provided a platform for appropriate questions and an interest for PAUWES students in their career plan. The organizers were very hands on and very good at getting feedback from exhibitors”. The day after, 29 May, a workshop/barcamp (an open, participatory workshop-event, the content of which is provided by participant) took place, aiming to design a model of Tech Hub at PAUWES for PAUWES students and staff as well as interested University of Tlemcen staff and PAUWES Institute partners, facilitated by Jörn Schultz, Adam Molyneux-Berry and Salma Mansour as representatives of the ICEHubs Global CIC, a consultancy company focusing set up of technology and innovation hubs in Africa. The agenda was only fully revealed on the day itself and was based on informal team interaction and participants’ dynamics. Having first of all practiced active listening, some inspirational “lighting pitches”, e.g. about the International Institute for Water and Environmental Engineering (2IE) Technopole followed. Then students and staff sat together in changing groups to define steps for the way forward. Eva Kimonye, Water Policy Student and equally Community of Practice Leader from Kenya, stated, “I was involved in the preparation and coordination of student involvement under the PAUWES Community of Practice teams. This involved working with the official organizers in delegating duties, learning to be behind the scenes and letting the respective groups develop own ideas on the respective duties and develop their skills. Overall, participating in the fair and workshop built my confidence and gave me a clearer picture on the educational skills and soft skills I need to build to have an upper hand in a very competitive job market”. A group of students who are enthusiastic about the entrepreneurship topic already came up with a “Hub for Innovation and Entrepreneurship” (HIVE) draft document in which they describe Student Enterprises, Incubation and an Employability Points Scheme. In the afternoon, a workshop with the objective of receiving experts’ feedback to perfect the UNU-EHS-developed concept of a future Industrial Advisory Panel (IAP) at PAUWES was conducted. Representatives from industry, policy/pan-African institutions, higher education institutions and research organizations attended the event. The events were part of the closing activities of the PAUWES project, preceding the Director’s and Coordination meeting conducted on 30 May.